Thom Ranch is the backdrop of Buffalo, Wyoming. With a balanced agricultural operation, magnificent views, abundant wildlife and live water - Thom Ranch has it all. The Ranch, with 5,588± total acres of which 5,175± acres are deeded, is rated at 250 animal units (AU). The varied topography consists of irrigated meadows, rolling hills, mountainous terrain, rock outcroppings, ponderosa pines and aspens, creating a prime habitat for the abundant wildlife. 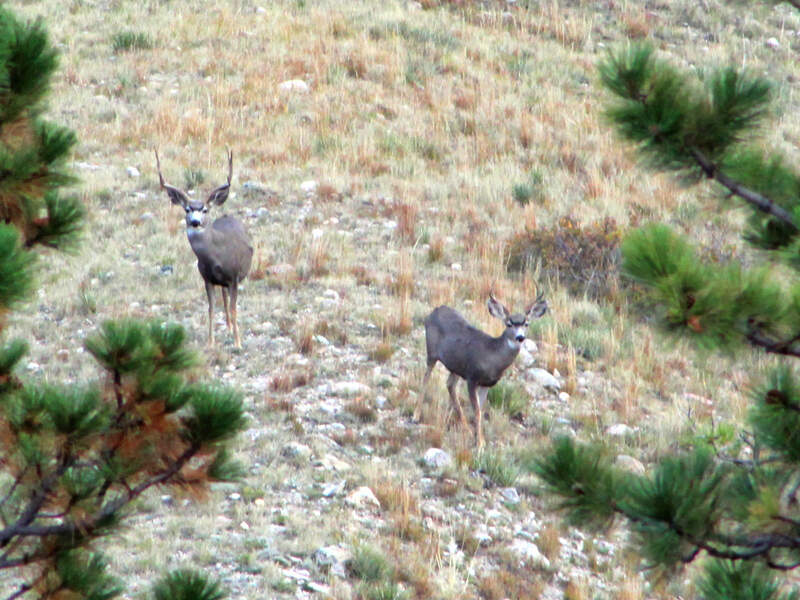 Trophy elk, black bear, mule deer, whitetail deer, antelope, and upland birds take advantage of this ideal wildlife habitat. Clear Creek, which meanders through the Ranch for approximately 3/4 miles, offers excellent fishing for rainbow and brown trout. 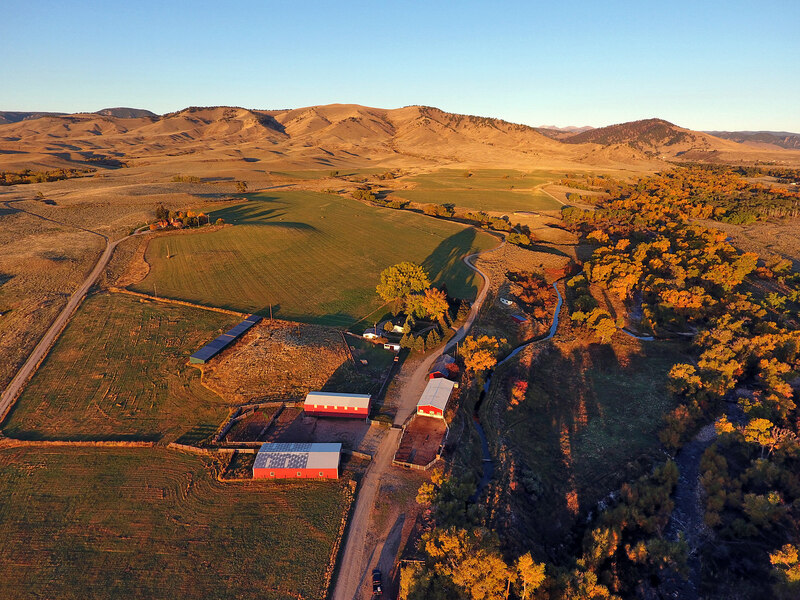 Located only 2.5± miles from downtown Buffalo, Wyoming, the Ranch is remarkably convenient yet provides a quality of seclusion rarely found so close to the amenities of town. This legacy ranch provides an opportunity to enjoy the best of Wyoming. 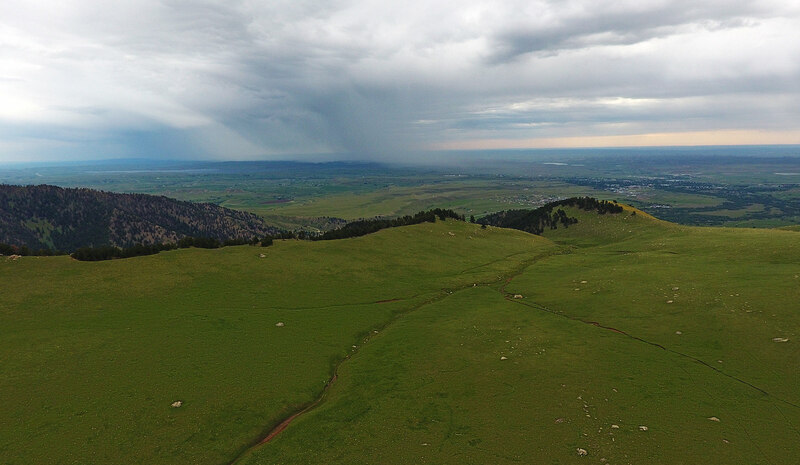 Located just 2.5 miles from downtown Buffalo, Wyoming, via Upper Clear Creek Road, the Ranch enjoys convenient year-around access just minutes from the amenities of town. Buffalo is a friendly town with a population of approximately 4,600. With quaint downtown shopping, dining, and art galleries, the warm welcome from the local business owners is readily apparent. Buffalo is able to provide all of the essentials with a modern hospital and clinic, two grocery stores, sporting goods store, four banks, several agricultural supply, hardware and lumber stores, a movie theatre, fine dining, and an excellent public-school system. Johnson County Airport (KBYG), a well-improved airstrip capable of handling good-sized aircraft, is located in Buffalo, Wyoming. The lighted asphalt runway is 6143’ x 75’ with a beacon operating from sunset to sunrise. 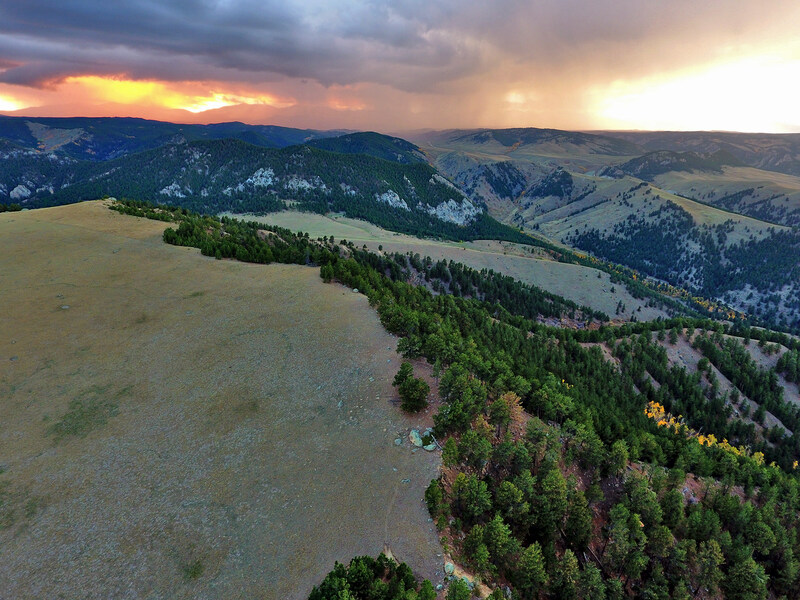 Sheridan, Wyoming, 30 miles north of Buffalo via Interstate 25 along the Big Horn Mountains, provides additional services including exceptional restaurants, large building-supply stores, Walmart, commercial flights connecting to Denver, and a fine downtown shopping experience. Sheridan provides a great mix of the old west and modern conveniences. Gillette, Wyoming, east of the Ranch, on Interstate 90 has commercial air service with connecting flights to several major hubs including Denver and Salt Lake City. Gillette also offers additional services for building supplies and equipment to satisfy nearly all the needs on the Ranch. The Ranch elevation ranges from approximately 4,840 to 6,900 feet above sea level. The local area experiences a semi-arid climate with moderate temperatures. The average annual precipitation in nearby Buffalo is 13.26 inches. With regard to cattle ranching, Buffalo and the surrounding area is considered by many cattlemen to be one of the most desirable locations to raise high-gaining cattle in Wyoming. This is due to the mild winters and wet spring weather which usually produces excellent quantity and quality of forage for livestock to utilize year round. The Ranch sits in the shadows of the Big Horn Mountains and benefits from the afternoon thundershowers which form above the 13,167 foot peaks of Cloud Peak Wilderness. With over 2,000 feet of elevation gain, the terrain of Thom Ranch is very diverse and covers multiple-microclimate zones. The riparian zone along Clear Creek bordered by thick stands of narrow-leaf cottonwood and river-birch trees transitions to the irrigated meadows and the broken foothills. As the elevation increases, the topography changes to steep hillsides of valleys and coulees with colorful shrubs, aspens, and ponderosa pines leading to vast mountain meadows atop Bald Mountain. The Ranch is currently utilized as a cow/calf operation with approximately 230 mother cows. With irrigated meadows and foothill pastures leading to the upper mountainous environment of the Ranch, cattle naturally utilize the forage at the accommodating time of year. Cows begin to calve in April on the meadows and are paired into the foothills during the spring. Cattle are moved to the higher elevations atop Bald Mountain in the summer, then return to the foothills and irrigated meadows in the fall. Calves are weaned and shipped to market around the first of October. Hay produced on the Ranch is fed to the mother cows during the winter months. The meadows are irrigated by ditches, gated pipe, and four-side roll sprinklers. The meadows consist mostly of brome/alfalfa mix with approximately 30 acres of alfalfa planted in 2014. Annual tonnage of hay produced on the Ranch is approximately 2 tons per acre with one cutting. The 5,408± acres of native pastures are comprised of buffalo, blue gramma, and several varieties of wheat grasses. The Ranch is rated at 250 animal units. Currently, the Ranch functions as a cow/calf operation with approximately 230 mother cows. The tenant runs fewer cattle to allow for extra growth on the pastures. Historically the Ranch has been able to produce between 270 and 360 tons of hay annually on 180± irrigated acres. A conservation easement with The Nature Conservancy was placed on the Ranch in 1998. It is the purpose of the conservation easement to preserve and protect in perpetuity, and to enhance and restore the significant natural habitat and ecosystems of the Ranch. The conservation easement allows for nearly all historical-land uses of good stewardship to continue, except for subdividing or further splitting the property. Two floating building envelopes can be developed on the Ranch if the new owner wishes to add improvements to meet their needs. The Seller hereby makes known that there may be variations between the property boundary lines and the location of the existing boundary fences on Thom Ranch. 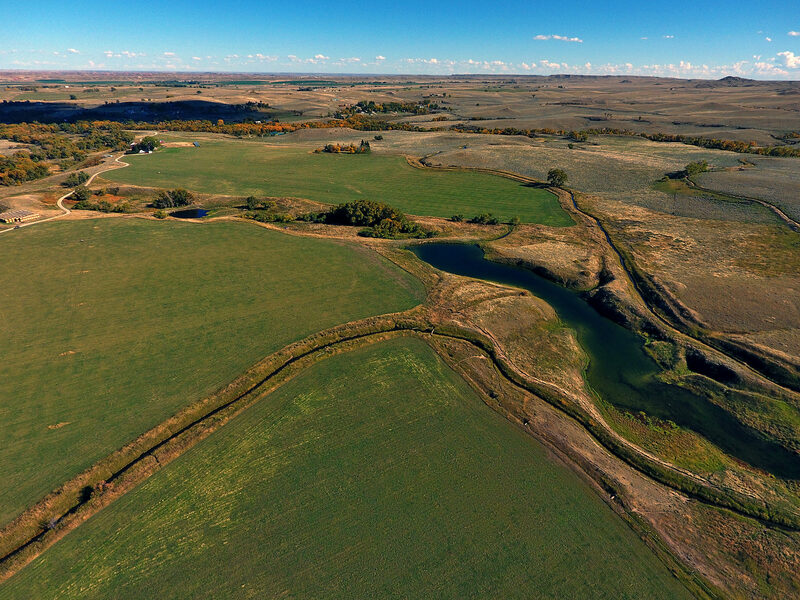 The Seller makes no warranties with regard to the location of the fence lines in relationship to the property boundary lines, nor does the Seller make any warranties or representations with regard to specific acreage within the fenced property lines. The Seller is selling Thom Ranch in its “as is-where is” condition which includes the location of the fences as they now exist. Boundaries shown on any accompanying maps are approximate. The maps are not to scale and are for visual aid only. The accuracy of the maps and information portrayed therein is not guaranteed nor warranted. All irrigation equipment used on the Ranch is owned by the current tenant and can be negotiated outside of this transaction. The 2016 real estate taxes are $5,696.53. Electricity is provided by Rocky Mountain Power. Propane is provided by Blakeman Propane. Telephone is provided by CenturyLink and cellular communication is available on the nearly all of the Ranch. Internet can be provided by Collins Communications. Domestic water is provided by a well and the sewage system is septic. The Ranch has direct-flow irrigation rights from Clear Creek dating back to 1906. PLEASE CLICK HERE TO DOWNLOAD OFFERING BROCHURE FOR DETAILED WATER RIGHTS INFORMATION. The Ranch is well watered by Clear Creek, numerous springs, irrigation ditches, and two underground pipeline systems which supply 11 stock tanks. 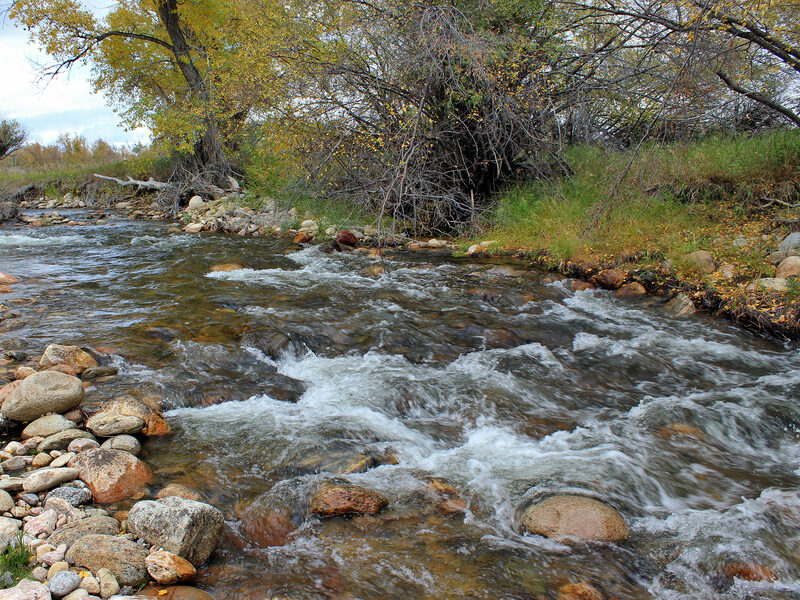 Clear Creek traverses the Ranch for approximately 3/4 mile. Clear Creek offers excellent fishing for rainbow and brown trout in its fast moving riffles and deep holes. The Seller will convey with the Ranch 100% of whatever mineral, oil, gas, geo-thermal, hydro-carbon and gravel rights they actually own, subject to reservations by previous owners. The Seller makes no representation as to the quantity or quality of any mineral or other sub-surface rights appurtenant to the Ranch. The improvements on the Ranch are well maintained with a neat appearance. This signifies the stewardship with which this Ranch has been managed. With three homes, horse barn, shop, and multiple storage buildings, the improvements on the Ranch are adequate for the operations of the Ranch. Two additional building envelopes are allowed on the Ranch to construct improvements suitable to the new owner. The manager’s home, built in 1915 and remodeled 2000, consists of 1,700± square feet, with 3 bedrooms, and 2 bathrooms. With stucco exterior and newer windows, the house is both modest and functional. The bunk house has been used for hunters and hired workers through the years. Built in 1920 and remodeled in 2000, the 1,250 ± square foot bunk house has 3 bedrooms, and 1 bathroom. Originally built as an office in 1973, this 1,250 square foot structure was converted in 2000 into a guest house with 2 bedrooms and 1 bathroom. The 40’ x 80’ all metal building was built in 1980. With a concrete foundation, one large overhead door, wiring for power, lights, and a 220 plug, this multipurpose storage building is highly functional. This 30’ x 75’ pole barn was constructed in 1985. Approximately 1/3 of the building is a shop area with concrete floor and propane heater. At the other end of the building is an enclosed calving area with a head catch and calving stall. Above the calving area is a loft for additional storage. A Morton building, constructed in 2001, functions as a horse barn, office, and shop area. Fully insulated and with a concrete floor throughout, this improvement is highly functional. The heated office is currently used a veterinarian room with hot water, refrigerator, and restroom. The horse barn area has three stalls, a tack storage area and opens to the attached metal corrals. The shop area has two overhead doors and is currently used as the main shop for the Ranch. Functional corrals consisting of metal and wood compliment the Ranch headquarters. The area economy is driven by agriculture, tourism, and energy development. However, through the boom and bust of energy development, agriculture has remained the backbone of the local economy. Tourism remains a viable economic factor as Buffalo is located at the intersection of Interstate 90 and Interstate 25, and is a logical stopping point for visitors heading to Yellowstone National Park. As a result, Buffalo has excellent hotel amenities and restaurants. The nearby Bighorn National Forest and Cloud Peak Wilderness provide endless sightseeing, hiking, camping, horseback riding, hunting, and fishing opportunities. 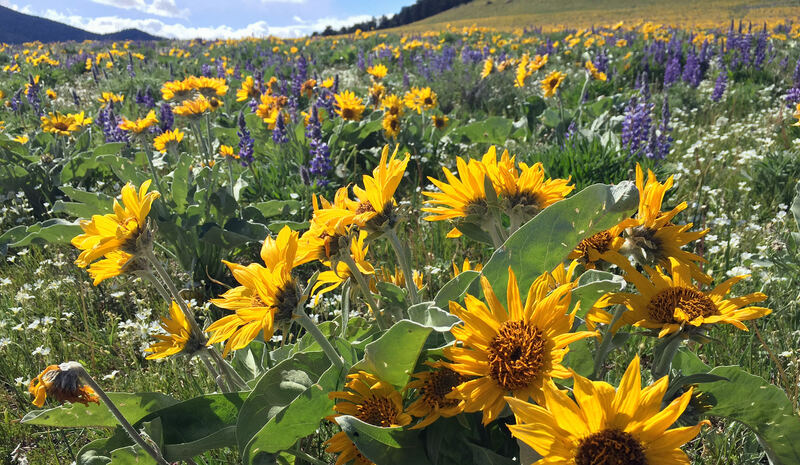 Wildflowers, rushing creeks, beautiful rugged terrain and good wildlife populations make the Buffalo area a prime destination to view the wonders of nature. The Ranch is home to an abundance of wildlife including trophy elk, whitetail deer, mule deer, antelope, sharp-tailed grouse, Hungarian partridge, pheasants, and turkeys. Clear Creek, which traverses the Ranch for ¾ of a mile, provides anglers the opportunity to fish private waters teeming with brown, and rainbow trout. With a healthy riparian zone of cottonwoods, river birch, and abundant grass, many species of wildlife are attracted to this habitat for food, water and cover. 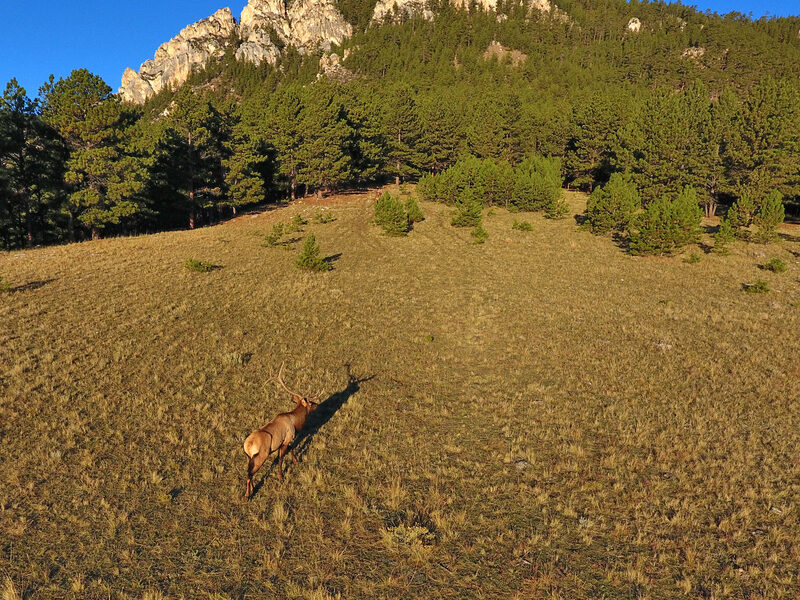 Located within the property boundary of the Ranch, the mountainous terrain atop Bald Mountain is home to elk, mule deer and antelope along with upland-game birds. Deep valleys filled with ponderosa pine and aspen make this the perfect rutting ground for elk. 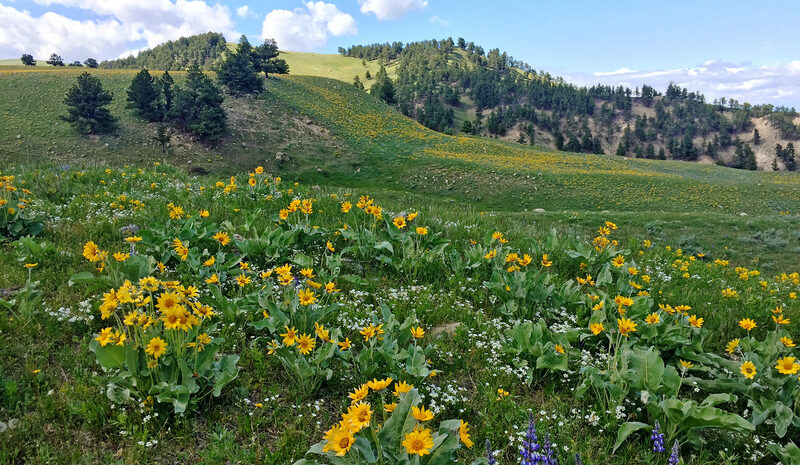 With the attraction of the irrigated meadows below, elk bed on Bald Mountain in the daytime and trail down to feed on the lush fields in the evening. Conveniently located to town yet with a high quality of seclusion, the well-balanced attributes of Thom Ranch create an extremely attractive offering in this region of Wyoming. 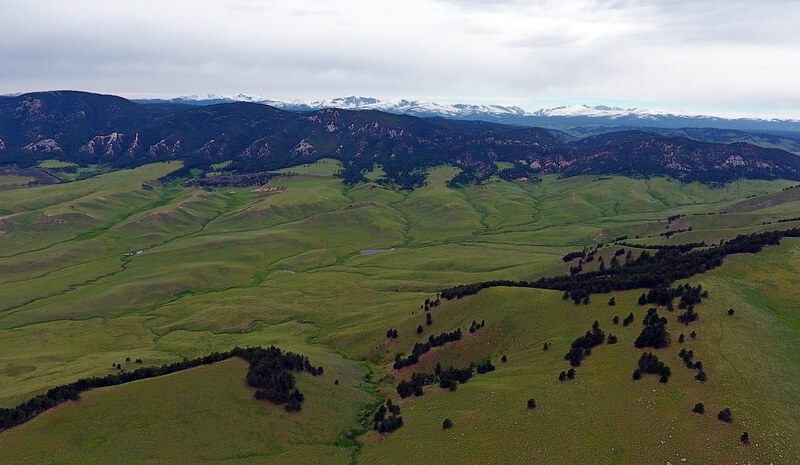 This 250 AU agricultural operation on 5,588± total acres is enhanced by the recreational facets available both on the Ranch and in the nearby Cloud Peak Wilderness Area. The observation of elk, deer, and antelope is inevitable. 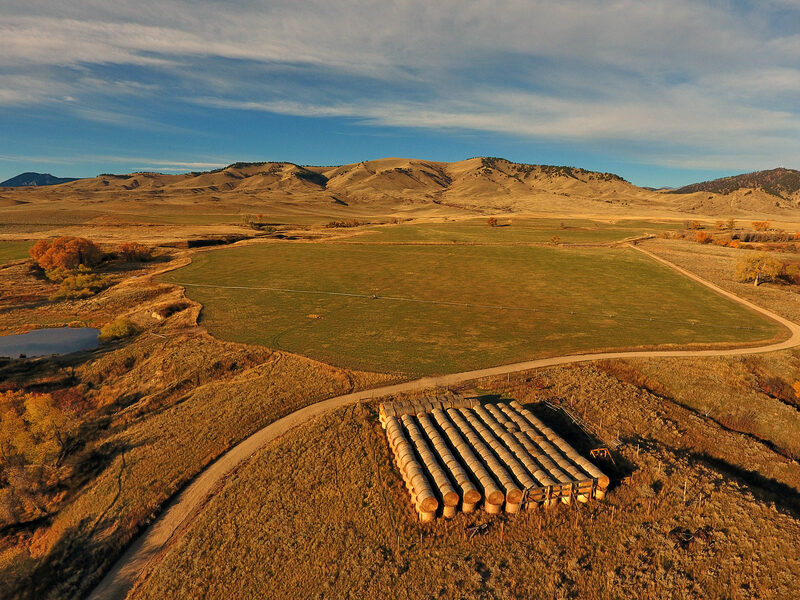 The ownership of Bald Mountain, which borders Wyoming state land and provides unlimited access to Bighorn National Forest, affords unlimited hunting, horseback riding, hiking, and other outdoor activities to the new owner of Thom Ranch. The private fishing opportunities in Clear Creek on the Ranch as well as fishing in the multitude of nearby mountain streams and lakes will satisfy the most dedicated angler. Priced to sell, this Wyoming Ranch for sale will provide the fortunate new owner, guests, and family the opportunity to enjoy this legacy ranch for years to come. Buyers’ Brokers are welcome and cordially invited to contact Scott Williams in our Wyoming Office for information regarding Cooperation Policies and Commission Splits.